Tottenham manager Mauricio Pochettino challenged his players to consistently show their "true quality" after an emphatic win over Stoke City at Wembley. Harry Kane scored twice as Spurs scored four second-half goals to climb above Arsenal into fifth in the Premier League table. It ended a four-game run without a league win, and Pochettino is demanding his side show the same consistency between now and the end of the season. "That is how we need to play from now," said the Argentine, after Spurs scored five for the first time this season. "Consistency between now and the end of the season is so important if we want to finish in the top four. The team showed their true quality." 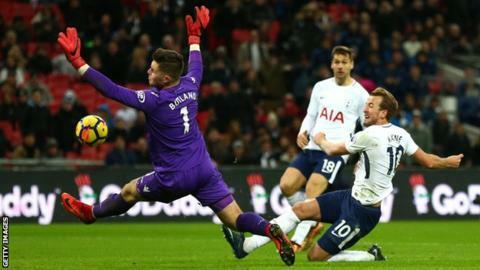 Spurs went ahead when Potters skipper Ryan Shawcross inadvertently diverted the ball past his own keeper - before three goals in the space of 12 minutes put the game out of sight. Son Heung-min doubled the lead and Kane's header made it 3-0. Kane drilled home the fourth, and Son set up Christian Eriksen for the fifth goal before Shawcross headed a late consolation. Pochettino admitted Tottenham's Champions League campaign had been a distraction. But with Spurs, who finished above Real Madrid in the group stage, not due to play in Europe again until February, he is hoping his side can concentrate on their domestic form. "Last season we were frustrated because we were very good in the Premier League but we were a disaster in the Champions League," he added. "This season the team was so determined to show they can compete in the Champions League and when you mix with the Premier League, that maybe was a bit of a distraction. "But now we can only be focused on the Premier League and winning games." Stoke, meanwhile, have won only once in seven league games and drop to 15th, three points above the relegation zone. They are the first club in Premier League history to lose to the same opponent by four goals or more in four consecutive meetings. Since demolishing Liverpool 4-1 in October, Spurs had won just once in six Premier League games. Their Wembley troubles have been well documented, but this was a match during which it all came together. Son has been the one shining light during a poor run in the league, and the South Korean was once again a driving force as Spurs scored more than once in a Premier League match at Wembley for only the second time this season. It was his low cross which led to Shawcross putting into his own net, and he scored the second goal and set up the fifth. After throwing away points against Burnley, Swansea and West Brom at Wembley, Tottenham were at their ruthless best. And they could have scored more but for Stoke keeper Jack Butland. The England international produced two fine stops in the dying minutes to keep out Eriksen, who was making his 200th appearance for the club, and Kane as the Potters were completely overrun. This was an embarrassing defeat at the national stadium for Stoke, who have now lost three of their past four league games. These are worrying times for Potters boss Mark Hughes, whose side started well but capitulated after half-time. Kane missed a glorious chance at 1-0 and Butland almost gifted the England striker a goal after losing control of the ball inside his own penalty area. Having let in four at home to Chelsea and another seven at Manchester City, Stoke are conceding at a rate of more than two goals a game. They have failed to win on their past 16 league trips to London, conceding 37 goals and taking six points from a possible 48 since beating Spurs at White Hart Lane in November 2014. "It's not good enough doing OK just for 45 minutes," said Hughes. "We couldn't deal with Tottenham's power and pace. We struggled in one-on-one situations, we needed to get tighter. "Today will damage our confidence. That is the worry for us." Son Heung-min is collecting man of the match awards at a phenomenal rate. This was another exceptional performance as he inspired Spurs to an easy win. Shawcross scored the sixth own goal of his Premier League career - only Richard Dunne (10), Martin Skrtel and Jamie Carragher (seven each) have scored more in the competition. This was the first time a Stoke player had ever scored at both ends in a Premier League game. Kane has scored eight Premier League goals against Stoke, only against Leicester City has he scored more in the competition (nine). Kane scored his 90th Premier League goal in just his 131st game - only Alan Shearer (113 games) did so quicker. This was Stoke's 1000th top-flight defeat, making them the 15th side to reach that figure since its inception in 1888-89. Spurs return to Wembley on Wednesday when Brighton are the visitors for a league game (kick-off 20:00 GMT), before Mauricio Pochettino's side visit leaders Manchester City next Saturday (17:30). Stoke are back on the road on Tuesday when they travel to Burnley in the Premier League (19:45). Match ends, Tottenham Hotspur 5, Stoke City 1. Second Half ends, Tottenham Hotspur 5, Stoke City 1. Attempt blocked. Fernando Llorente (Tottenham Hotspur) right footed shot from outside the box is blocked. Assisted by Ben Davies. Corner, Tottenham Hotspur. Conceded by Kevin Wimmer. Attempt missed. Ben Davies (Tottenham Hotspur) left footed shot from outside the box misses to the right. Assisted by Christian Eriksen following a corner. Attempt saved. Harry Kane (Tottenham Hotspur) right footed shot from the centre of the box is saved in the centre of the goal. Assisted by Erik Lamela with a through ball. Hand ball by Mame Biram Diouf (Stoke City). Attempt missed. Erik Lamela (Tottenham Hotspur) header from the centre of the box is too high. Assisted by Kieran Trippier with a cross. Corner, Tottenham Hotspur. Conceded by Geoff Cameron. Attempt saved. Christian Eriksen (Tottenham Hotspur) right footed shot from the centre of the box is saved in the centre of the goal. Assisted by Son Heung-Min. Goal! Tottenham Hotspur 5, Stoke City 1. Ryan Shawcross (Stoke City) header from the centre of the box to the bottom right corner. Assisted by Darren Fletcher with a cross following a corner. Substitution, Stoke City. Ibrahim Afellay replaces Joe Allen. Corner, Stoke City. Conceded by Jan Vertonghen. Substitution, Tottenham Hotspur. Moussa Sissoko replaces Harry Winks. Substitution, Stoke City. Geoff Cameron replaces Xherdan Shaqiri. Goal! Tottenham Hotspur 5, Stoke City 0. Christian Eriksen (Tottenham Hotspur) left footed shot from the centre of the box to the bottom right corner. Assisted by Son Heung-Min with a through ball following a fast break. Corner, Stoke City. Conceded by Ben Davies. Attempt saved. Erik Lamela (Tottenham Hotspur) left footed shot from very close range is saved in the bottom right corner. Assisted by Son Heung-Min. Substitution, Stoke City. Peter Crouch replaces Thomas Edwards. Attempt blocked. Harry Kane (Tottenham Hotspur) left footed shot from the centre of the box is blocked. Assisted by Erik Lamela. Substitution, Tottenham Hotspur. Erik Lamela replaces Dele Alli.